I love this chapter in Psalms and as a single mom, I have taken great comfort in knowing that the King of Kings and Lord of Lords is protecting me. Night and day, He watches over me and my children. Night and day, He sends angels to protect us and keep us safe. Let this passage speak to you, as it has to me, my sweet single mom friend. Take time to meditate on the words. Let the words sink into your heart. In your journal or notebook, write this passage out in your own words. Write down what you feel God is saying to you in this passage. Write a prayer of praise, thanking God for His protection. 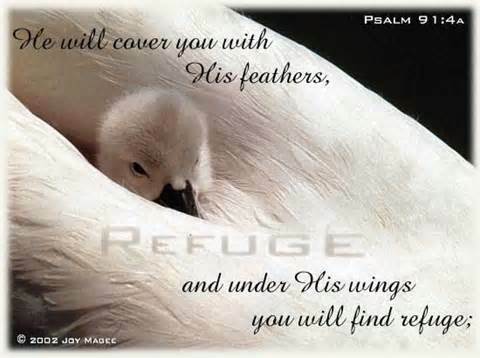 Express your gratitude for the strong wings that He shelters us under. He longs to shelter you and your children. Abide in Him. He is waiting and He loves you and your children so much! Read this passage again and let the God who loves you speak to your heart. If you need prayer today, contact me. If you are ready to accept Jesus into your life, contact me. God loves you and so do I.